Honestly, Kentucky is not Grits Central. We are more about cornbread, spoonbread, and those lacy, crisp wonders some of us call "corn cakes" and some call "fried cornbread" or "lace cornbread." Sunflower Sundries, a pure Kentucky wonder of a farm and small food production enterprise, may change all that with their organic, white Hickory King heritage grits. Put all ingredients in a slow cooker. Cook on low heat for 5-6 hours, or on high heat for 3-4 hours, until the grits are thick and the corn bits are tender. Adjust the seasonings. Add, if you wish, butter, Parmesan or other cheese, sautéed onions, finely chopped parsley or other herbs, dried or fresh hot peppers. Sauté a small onion in bacon fat. Add chopped county ham bits and cook until some of the ham gets a bit crispy. Add a glug of sherry and scrape up the bits from the bottom of the pan. Add cream to taste and warm through on very low heat. Add slivered or grated Parmesan cheese to taste. Adjust seasonings, adding salt and pepper as needed. Even without the topping or additions, these grits bring flavor to the summer table without heating the kitchen. They pair beautifully with summer bounty: tomatoes, green beans, squashes, onions, greens, salads. Good Foods Market carries Sunflower Sundries grits, refrigerated, near the pickles. 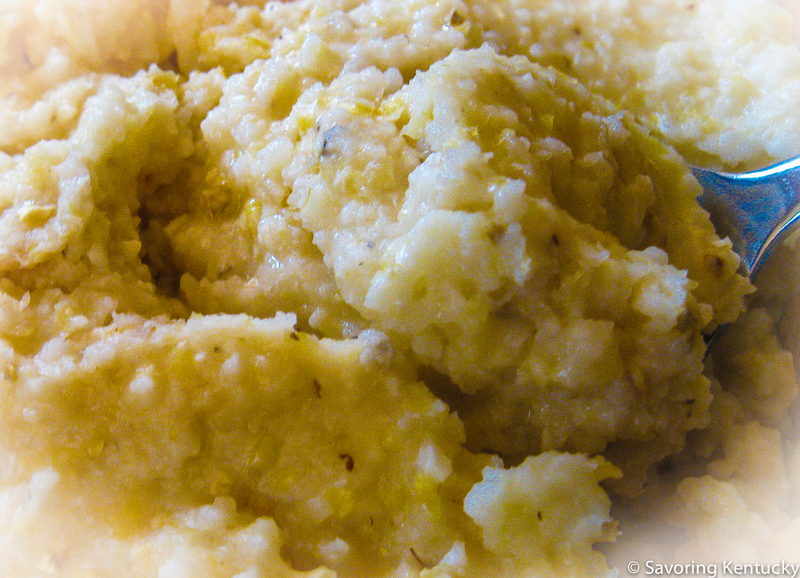 Sunflower Sundries hopes to expand the amount of these Hickory King grits available this year. Maybe the grits will return to Sunflower Sundries' online store, so more people can experience their extra dimensions.